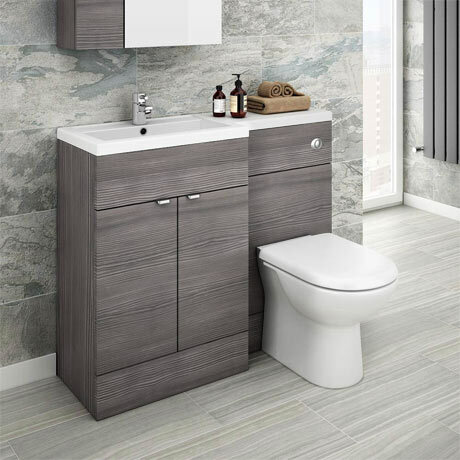 The stylish Brooklyn 1100mm wide grey avola textured wood effect bathroom combination unit, perfect for renewing the style in any bathroom. It's stylish modern design hides all unsightly pipework creating a neat modern streamlined look. Provides great storage space allowing your bathroom to be clutter-free. The WC unit has a removable front panel which can be drilled for right or left hand front flush. Features contemporary chrome effect handles and a solid L-shaped poly-marble square basin with worktop. Q. Any idea when this will be back in stock please? Items look much better than the images. Fantastic quality quick and easy ordering quick delivery well done. "Can't believe the units cams built up, plumber says he can fit whole thing in an hour, quality is more than I expected." Lovely unit and looks to be good quality. Can't wait for our plumber to fit it now! "Good quality finish, looks really good."